Who knows better about what you need during your pregnancy than a fellow mom? The Leachco Snoogle Total Body Pillow, uniquely designed by a Registered Nurse and a mother, is our number one pick for the best pregnancy pillow. It’s the one pillow that takes the place of multiple pillows: Not only does it follow the natural contour and shape of your body, but it can also double as a lower body cushion when sitting, a cushion for tummy support during or after pregnancy, and an upper and lower body elevation pillow. Seriously, the Leachco Snoogle Total Body Pillow does it all. Pregnancy is a beautiful thing. You’re growing a human inside you and then devoting your life to raising this child into adulthood. Before you’re able to meet your tiny little ray of sunshine, though, you have to go through 9 months of labor carrying that baby inside of you. That’s hard work! Picture this: You’ve just finished a long day of work, food shopping, cooking, cleaning the house, and showering, and now you’re exhausted and ready to crawl into bed. But something stops you from having a peaceful and relaxing sleep — your baby bump. Night after night it’s the same issue. You struggle to find a comfortable sleeping position that will offer your belly support and allow you to get the peaceful sleep you deserve. We have 2 words for you: pregnancy pillow. The amazing thing about pregnancy pillows is that they’re designed specifically for pregnant women! Shocker, right? They’re created with the purpose of supporting your baby bump throughout the night (or anytime you’d like to kick back and relax a little) and they assist your body with easing into a comfortable position so that you can get the relaxation you deserve. Carrying a baby for 9 months takes a toll on your body, but a good pregnancy pillow can have you feeling like a brand new person. Check out our list of the best pillows for your pregnancy. Here are our top pregnancy pillow picks to help you ease the discomfort of that baby bump. This multi-talented pillow does it all. Since it was designed by a Registered Nurse and a mother, we’re not surprised! Conforming to fit the shape of your body, the Leachco Snoogle Total Body Pillow supports you in any position you can imagine. You don’t always have to sacrifice quality for the sake of your budget, and the Hiccapop Pregnancy Pillow is the perfect example of this. With 2 sides of different thickness, this versatile wedge-shaped pillow adjusts to meet your changing needs, making sure you’re comfortable throughout all stages of pregnancy. Most pregnancy pillows focus only on your belly bump, but the Leachco Back ‘n Belly Contoured Pregnancy Pillow knows how important back support is too. So this pillow is designed to address both! No pillow adjusting or fluffing required — and you can rest easy knowing it’s environmentally friendly, too. Pregnancy can be a magical 9 months, filled with memories, bonding experiences, and exciting milestones. But the truth is, many pregnancies are far from strictly sunshine and rainbows. Back pain, joint pain, heartburn, restricted breathing, and having to wake up every few hours to pee are only some of the many challenges preventing pregnant women from getting their full 8 hours of sleep each night. It can be extremely difficult to find a sleeping position that supports your body throughout the night and allows you to get some shuteye. This often results in a type of pregnancy insomnia. And with all the energy that soon-to-be bundle of joy is taking out of you each day, we know how much each minute of sleep counts. When your nights become sleepless, your entire attitude toward pregnancy can shift. So what can be done? Fortunately, there’s an easy way to help pregnant women actually get their 8 hours of sleep. Yes, you heard that right! Finally something that will help you get the rest you deserve. The solution is much simpler than you may think, and it’s a pregnancy pillow. The best thing about pregnancy pillows is — wait for it — they are created specifically for moms-to-be, and most of them are designed by other moms. Who would’ve thought! Pregnancy pillows come in many shapes and sizes, and they are definitely distinct from your average pillow. One thing rings true for all of them — they offer you the support you need during pregnancy. And we’re not just talking belly support. We’re talking knee support, hip support, and back support as well. Pregnancy pillows feature various shapes, curves, and padding to support all areas of your body, especially your belly. They take the stress and strain off of you so you can get the sleep you deserve. Seriously, you’re going to wake up in the morning feeling refreshed and wondering why you didn’t invest in one of these bad boys sooner! Regardless of how you slept pre-pregnancy, there’s a pregnancy pillow out there that will adjust and conform to not only your body shape but your sleeping preferences as well. 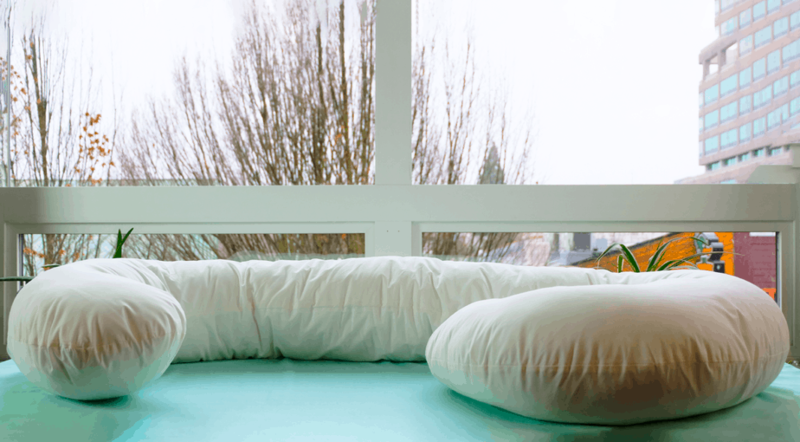 We gathered together some of our favorite pregnancy pillows to save you the time and energy of having to track them down yourself. You’re already making a ton of sacrifices during your pregnancy — your restful night of sleep doesn’t need to be one of them! All of these criteria go into the calculation of a RAVE Meter score for each product. Based on this analysis, we’re confident in our final selections of the very best pregnancy pillows available today. Number one on our list of the best pregnancy pillows out there is the Leachco Snoogle Total Body Pillow. This pillow easily takes the top slot because it offers a ton of amazing features, while still being impressively affordable. Designed by a Registered Nurse and a mother, this pillow makes sleeping and relaxing super cozy. We especially love that it’s flexible enough to be customizable to your own unique comfort positions. It features a zippered, removable, machine-washable cover made from 300-thread-count sateen cotton. This pillow follows the natural contour and shape of your body, eliminating the need to use multiple pillows throughout the night. And, if for some reason this pillow doesn’t suit your needs, a 90-day limited warranty allows you to exchange or receive a refund for your product. 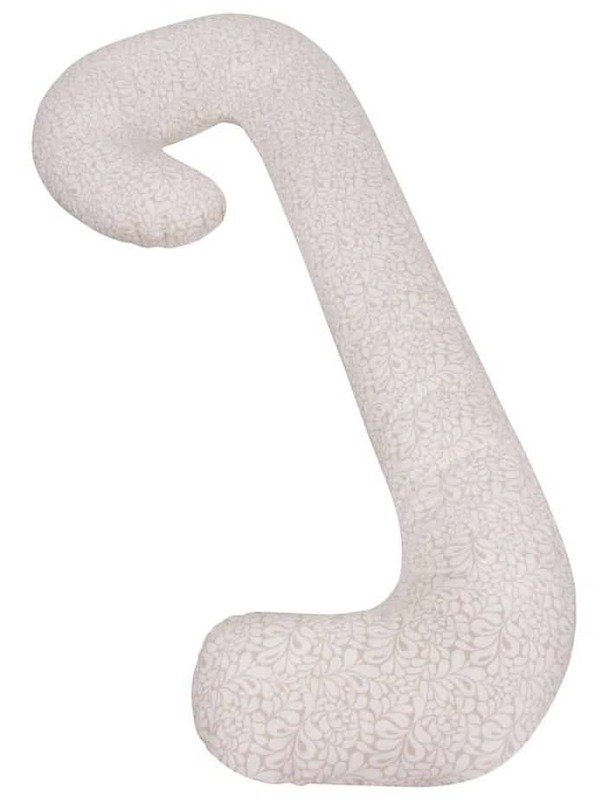 Our pregnancy pillow runner-up is also from Leachco: the Back ‘n Belly Contoured Pregnancy Pillow. What makes this pillow so great is that not only is it focused on belly support — it also pays just as much attention to back support. That’s a huge bonus for pregnant women. This pillow features a unique shape, with inner contours that are designed to follow the natural curves of your body. Many women have found that it provides the perfect amount of support for the neck and shoulders as well as the back and belly. Like the Snoogle, this pillow comes with a zippered, removable cover, making it easy to wash. While it’s a bit pricier than our number one pick, this pillow ranks in at number 2 because despite the cost, it’s a thoughtfully designed pregnancy pillow that will suit the needs of almost all mothers-to-be. Ranking in at number 3 is the Queen Rose Full Pregnancy Body Pillow. Designed to caress the natural curves of the body, this pillow keeps your back and belly supported, while keeping you comfortable and relaxed. Not only is this pillow comforting during pregnancy though, it’s also perfect post-pregnancy while nursing, keeping your baby supported which in turn will leave you in a comfortable position. This pillow’s cover zips off and is machine washable and the pillow is made from a 100% polyester fiberfill, making it soothing and comforting with the amazing ability to conform to the natural shape of your body. This pillow is a game changer if you are pregnant. 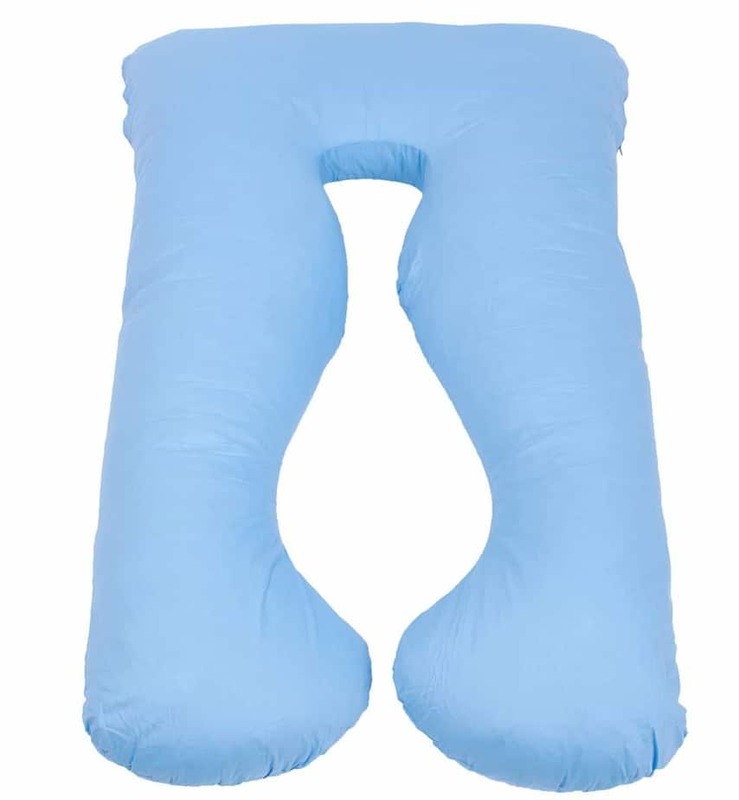 The great thing about the Hiccapop Pregnancy Pillow is unlike the previous 3 pregnancy pillows, this one is wedge shaped, making it versatile, compact, and easy to travel with. It even comes with a handy travel bag, making it even more compact and ensuring it stays clean wherever you take it. Its dual-layer design offers a soft memory foam layer on one side as well as a firm layer on the other, making it the perfect pillow for your shifting needs and desires. Simply flip the pillow over to gain maximum comfort. Plus, tiny holes encourage airflow to help control and regulate your body temperature. This pillow features a removable, washable pillowcase and presents you with an unconditional lifetime guarantee. Seriously. Even after 10 years of owning this pillow if your zipper breaks you’ll receive a new one within 48 hours. Plus, it’s our most budget-friendly pick! 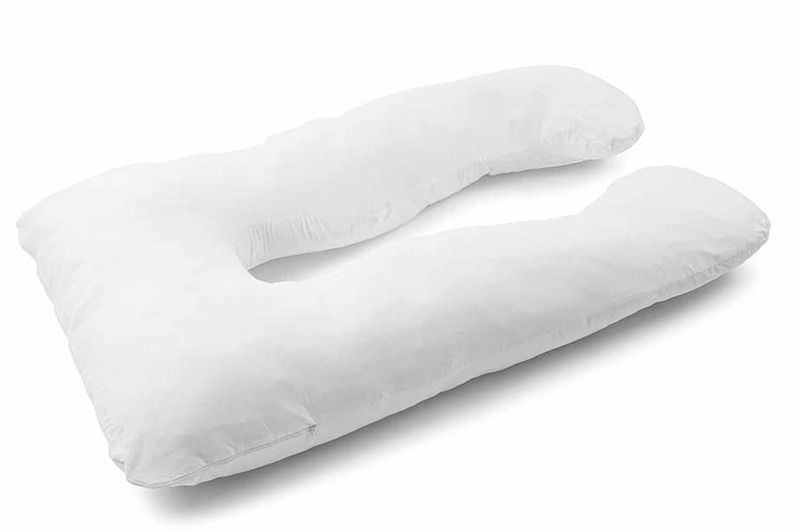 With a 100% cotton shell and a 100% hypoallergenic polyester fill, the Pinzon Down Alternative Body Pillow ranks in at number 6 in our top 10 pregnancy pillows. The perfect choice for allergy sufferers, this pillow is affordable, comfortable, and totally worth every penny. 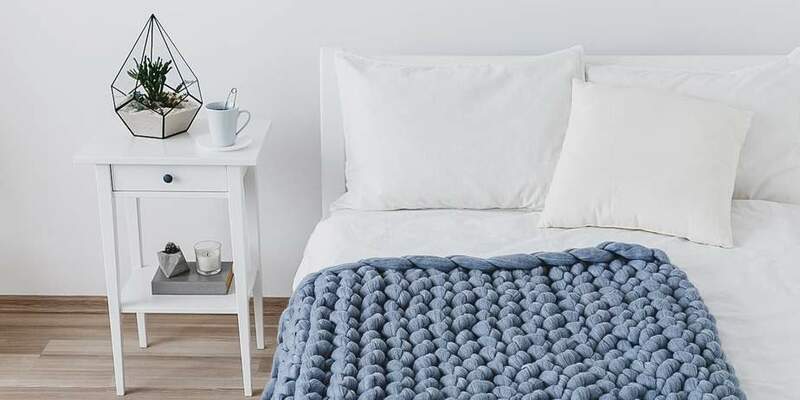 This pillow fits the natural contours of your body, which makes it ideal for side sleepers, and it even includes a 230-thread-count zippered pillowcase which is removable and machine washable. It also can be placed behind you so you can experience full back support when leaning against it. Or place it between your knees to release back pressure! Though it feels lightweight, its down-alternative fill makes this pillow breathable and quickly releases body heat and moisture vapor to the surface, ensuring a more comfortable and temperature regulated night’s sleep. The ComfySure U Shape Full Body Pillow earns a spot in our ranking because of its exceptional versatility. Not only is this pillow designed for expecting and breastfeeding mothers, it’s also great for anyone who is a side sleeper. It offers belly, arm, and neck support, and it does a great job of relieving the pain and discomfort that can come from regular pillows. This pillow is made from 100% polyester, so it’s ideal even for people with allergies and sensitive skin. It’s ultra soft and features a removable cover. Not only is the cover machine washable, but the pillow itself is as well. This pillow isn’t only meant for sleeping. 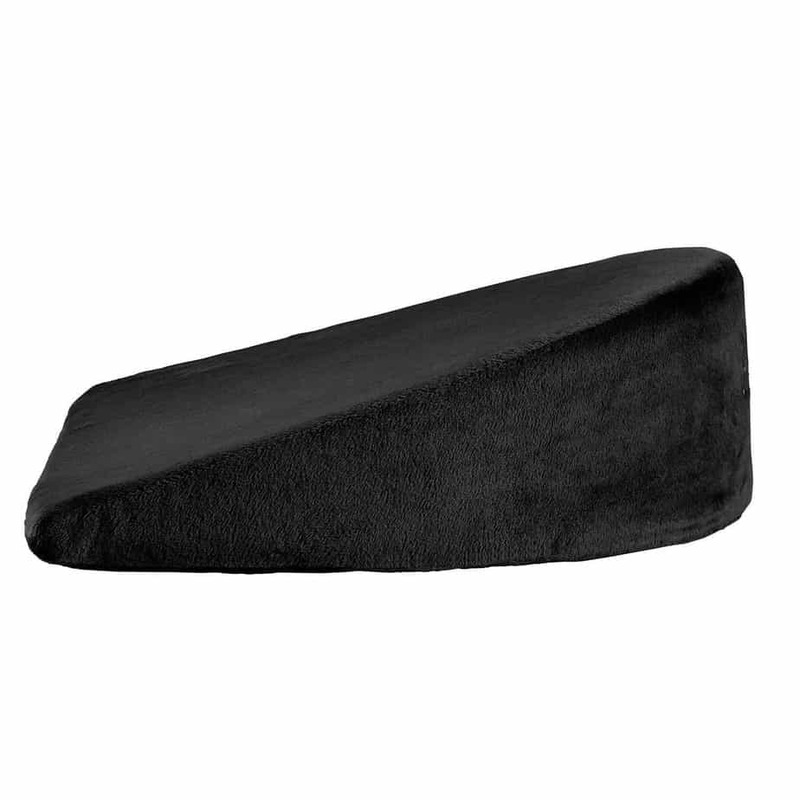 It can be used as a lounging or reading cushion, and is perfect for providing support to you while watching TV. 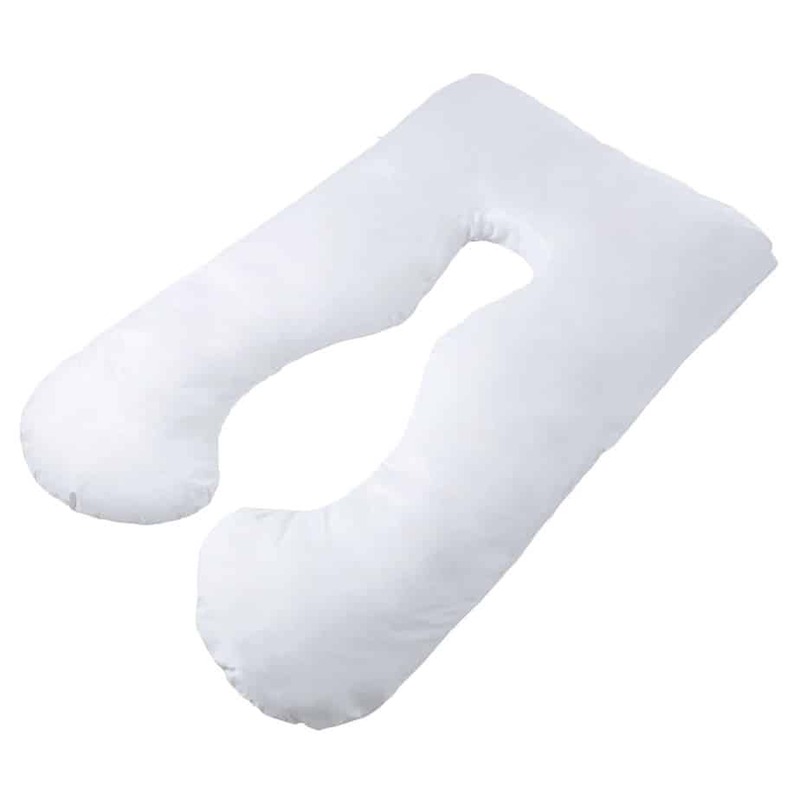 Its extra-large size makes it the perfect replacement for all your other pillows, and it also relieves aches associated with sciatica, reflux, and more. The Lavish Home Full Contoured Pillow is an oversized U-shape body pillow that is long enough for you to stretch out on and provides equal support to both sides of your body. Its hourglass inner shape contours to your body while aligning your hips for neutral joint positioning. It helps eliminate tossing and turning and provides ultimate sleeping comfort. This pillow is versatile, and can be easily formed into multiple positions to provide support for reading, watching TV, relaxing, or sleeping. It’s perfect not only for your pregnancy, but also for post-pregnancy nursing, helping to keep the baby elevated while cushioning your own back. The cover is removable and machine washable, and is made from 100% cotton. The pillow is especially popular for easing the discomfort associated with sciatica, fibromyalgia, back pain, and more. That said, it doesn’t offer quite as much support as other pillows with a similar design, which is why it falls to seventh place. As one of our pricier pillow picks, the Moonlight Slumber Comfort U Maternity Pillow ranks in at number 9. This is a great side sleep aid for expectant mothers, as it’s designed to help mothers-to-be get comfortable in the side sleep position recommended by gynecologists. 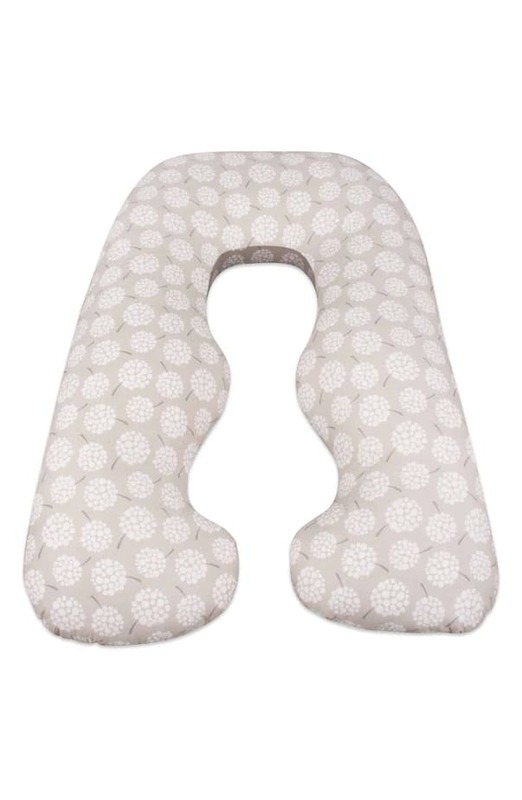 Designed in 3 parts, a nursing pillow and 2 bolsters, this pillow will grow with your child. This makes it useful not only during pregnancy, but for well after pregnancy as well. Considering it’s one of the most expensive options on the list, it’s great to see that at least you can count on using it for a long time. All 3 pieces of this pillow fit into a standard washer and dryer, and they’re guaranteed to never clump up or lose their shape. The best part: The manufacturer offers a lifetime warranty. When it comes to the Web Linens Oversized Total Body Pregnancy Pillow, we think you’re going to love it. But just in case you don’t, the manufacturer offers a 30-day, no-questions-asked, money-back guarantee. And we’re guessing the only reason you’d think about returning this pillow is due to the price point, which pushes it down to number 9. This oversized total body pregnancy pillow has a 400-thread-count cover, with a super soft 100% microfiber polyester shell and filling. It also comes with a zippered, removable cover, making it super easy to machine wash. Its classic U-shaped design means it’s the perfect pillow for complete and full support of not only your belly, but your back, hips, and knees as well. Despite the price, it’s one of our favorite pregnancy pillows out there. 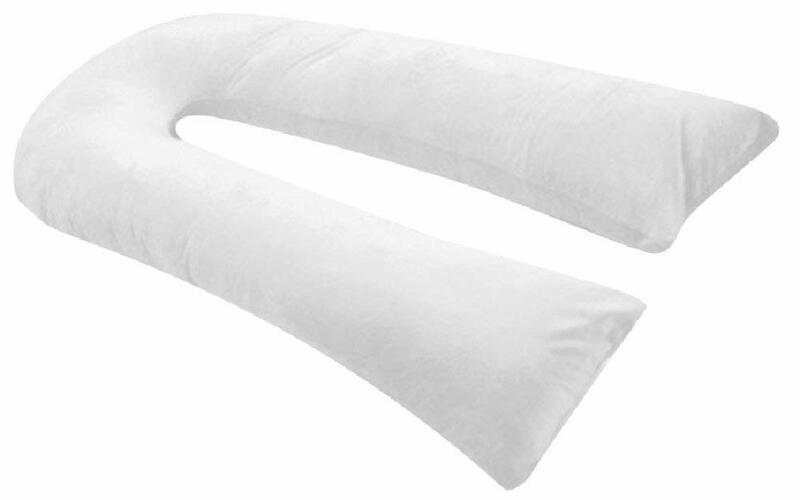 Rounding out our list of the top 10 pregnancy pillows is the PharMeDoc Pregnancy Pillow. This full body pillow, similar in shape to the Leachco in our top slot, is designed to ensure that expecting mothers will get the well-needed rest they deserve. 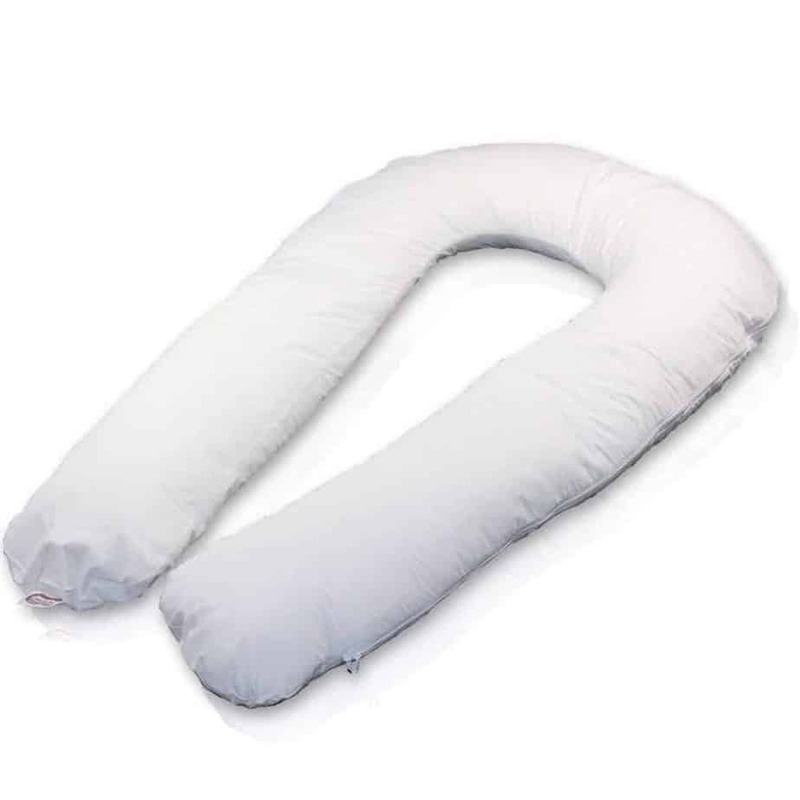 This pregnancy pillow aligns your neck, head, hips, and back, which means you can ditch all the extra pillows you’ve been trying to wrangle into place around you. It’s built for optimal support and maximum versatility, whether you’re sleeping, nursing, or just looking to relax and take a breather. This pillow’s adjustable polyfill material provides comfort in any position, while the zippered removable cover is both hypoallergenic and antimicrobial. This pillow ranks in at number 10 because it’s not as consistently high-quality as the others higher up the list. Nonetheless, it’s still a great option for expectant mothers. Who should use a pregnancy pillow? The answer to this question may seem pretty obvious, but it goes a bit deeper than you think. The first and foremost best candidate for a pregnancy pillow would be none other than a pregnant woman. Pregnancy is a tough 9 months, and it takes a serious toll on the body. Neck pain, back pain, joint pain, belly pressure, and hindered breathing are just some of the many issues pregnant women face. It doesn’t stop there, though. The truth is pregnancy pillows are amazing not only for pregnant women, but for anyone out there who needs extra support while they sleep. Pregnancy pillows target those areas of the body that often need a little extra tender love and care, like the neck, back, and hips. Why are pregnancy pillows important? We already know there are tons of rules and guidelines pregnant women must follow during their 9 months of pregnancy. These rules include abstaining from certain foods, certain types of medicine, and alcohol. They have to avoid participating in some activities, and they have to be conscious that their growing baby is getting the nutrients they need. Well, these rules and guidelines also follow pregnant women to bed. There are certain ways pregnant women should and should not sleep during the night. This can obviously put a strain on a pregnant woman’s night of sleep, especially when they’re no longer able to sleep in their favorite position. Pregnancy pillows ensure pregnant women are sleeping in positions that are safe for not only themselves, but their baby as well. Not only do pregnancy pillows comfort the body, though. They can also provide serious benefits to a pregnant woman’s mind. Pregnancy can take a serious mental toll on women, and getting a full 8 hours of sleep can have a big impact on whether they’re mentally prepared to make it through their day. Pregnancy pillows are the perfect solution for giving pregnant women, as well as anyone else who suffers from chronic body aches and pain, the restful sleep they deserve. How can pregnancy pillows help? Just like many products out there, there is no one-size-fits-all when it comes to pregnancy pillows. Even though most women experience many of the same burdens and milestones with pregnancy, no 2 experiences are exactly alike. Pregnancy pillow makers understand this. That’s why there are tons of different pregnancy pillow variations out there for you to choose from! The underlying purpose of each pillow, though, is the same, and that is to offer the support you need to get a peaceful and refreshing 8 hours of sleep. This is true whether you’re pregnant or just someone who suffers from chronic pain and aching joints. These pillows conform to fit the contours of your body and then cushion the areas you’re most likely experiencing pain, such as the neck, belly, back, hips, and knees. With a pregnancy pillow hugging the natural shape of your body, you’ll finally wake up feeling refreshed and energized rather than groggy and in pain. What are the best pregnancy pillows? 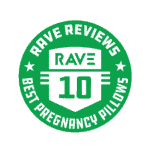 We’ve searched the Internet high and wide in order to gather together the best of the best when it comes to pregnancy pillows. We know how stressful a pregnancy is to begin with, and so we made it easy for you to find the pillow that best fits your needs. Our top 10 picks can be found up above, along with the most vital information for each pillow. And we even included the pros and cons of each pillow for you, because we know nothing is perfect. When it comes to the best pregnancy pillow overall, the Leachco Snoogle Total Body Pillow is our winner. This pillow has everything you’d want in a pregnancy pillow. 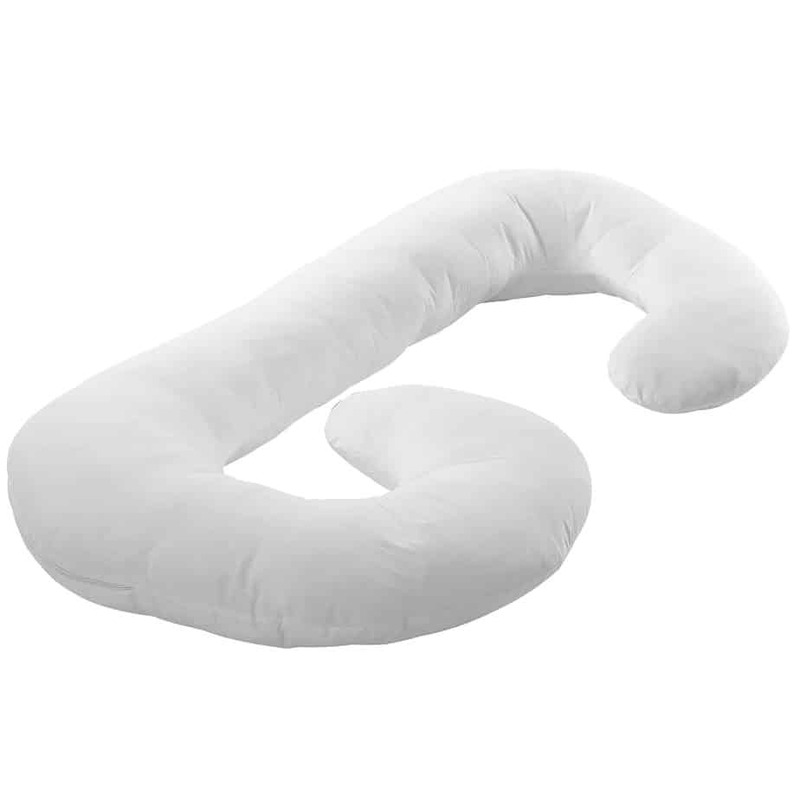 Its ability to twist and contort itself into different shapes ensures that this pillow can give you the support you need whenever you need it — not just during sleep! Take a look at our full list of the 10 best pregnancy pillows that will have you sleeping like a baby. Pregnancy pillows aren’t the only things that can make your pregnancy more comfortable. Check out some of our other favorite pregnancy and post-pregnancy must-haves. Maternity Support Belt: This Maternity Support Belt features an abdominal support pad that tucks under the belly and lifts it up, allowing you to position and adjust it to your growing belly. Boppy Pillow: The award-winning Boppy Pillow has become a nursery staple. Thanks to its versatile design, this pillow is perfect for propping, tummy time, and learning to sit. It’s comfortable, it transitions easily, and it’s super cute for your baby. Nursing Bra: You don’t have to sacrifice style or fit to find the right nursing bra. This Classic Nursing Bra is our go-to pick. Super soft fabric soothes the skin while easy-open cups are perfect for feeding and pumping. Wristband for Nausea Relief: These wristbands are a drug-free solution for nausea due to morning sickness. Those who suffer from common yet debilitating nausea can feel better in both style and comfort as the wristband pushes into acupressure points on your wrist.